Spend a week idling, learning about ancient, medieval and modern thought, wandering around the great churches and artworks of Umbria and feasting in good company. 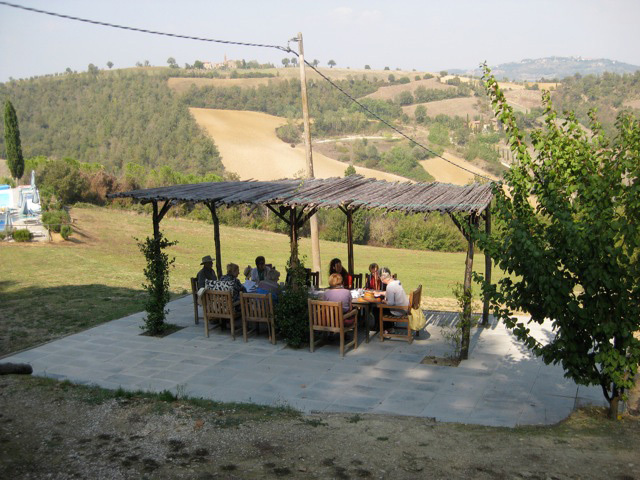 Our Idler Retreat takes place at the wonderful Villa Pia on the Umbria/Tuscany border. Idler editor Tom Hodgkinson and Academy director Victoria Hull will be your hosts. Our tutors will be author, broadcast and philosopher Mark Vernon and author and art historian Tim Richardson, the Idler‘s art critic. There will be a foraging walk in the Umbrian hills, yoga as well as a trip to Assisi. Morning light at Villa Pia. Photo by Yvette McGreavy. The Idler Retreat is an opportunity to take a break from the hurly-burly to work out how you want to live your life while rambling around beautiful countryside, living the good life and taking in the scenery and art. You’ll go home with new enthusiasm and great ideas for living. Prices are from £999 per person, including all food, drink and classes. Secure your place now with a £500 deposit. Location: We’ll be staying at beautiful Villa Pia, which sits on the border of Tuscany and Umbria on the edge of the medieval village Lippiano. The villa has a swimming pool and tennis court with gorgeous views over the Umbrian hills, table tennis, yoga studio and extensive gardens in which to rest and read. During the day we shall go on trips, take classes, go for walks and take naps. The evenings are for feasting. In his classes Tom will teach the history of idling and the principal schools of ancient philosophy. We’ll be applying these ideas to our own lives and investigating the good life. Tom is the author of seven books including How to be Idle, How to be Free and a history of the ukulele. He founded the Idler in 1993. Mark Vernon will be talking about the ways thought has changed from the time of Plato to the modern day. Dr Mark Vernon is a broadcaster, author and therapist. Mark runs the ancient and modern philosophy courses at the Idler Academy and has filmed several online courses for us. He works as a therapist at the Maudsley Hospital in south London. Mark is a wonderful communicator who knows his subject inside out and can convey difficult subjects with great clarity and precision. On the Idler Retreat we’ll visit the beautiful medieval city of Assisi, home of St Francis. Tim Richardson will give a preview talk the day before and everyone will be given a printed digest of the highlights to look out for, so we can either walk around together or go off on our own. Tim Richardson is a long-time Idler contributor who specialises in gardens and art — and the point where they intersect. He is the author of a number of books on garden and landscape subjects as well as a volume of poetry and a world history of sweets and confectionery (!) He writes about art for Country Life, the Daily Telegraph and Apollo. He is the founder and director of the Chelsea Fringe Festival. Claire will lead a yoga session most days including meditation and yoga philosophy. Claire plans three morning practises of invigorating yoga “embracing a sense of positivity and vitality, working mindfully through the poses using the breath”, and two or three evening restorative yoga practices, “All mat based where poses are held for longer to allow the body to totally relax and release any muscular or deeper tensions, allowing the body’s natural healing mechanisms to switch on and leaving you feeling rested and restored and deeply relaxed”. Claire has been practising yoga for 25 years and trained as a teacher at Yoga Campus. With an interest in the therapeutic qualities of yoga, she emphasises that the physical benefits of asana are only a small part of the joy of yoga and teaches how the combined use of body, breath and mind help us discover who we really our and our path in life. Clare weaves meditation and yoga philosophy into her classes. The retreat at Villa Pia is all inclusive. You’ll have nothing to do except learn, eat, drink, rest and read. We’ll be providing breakfast, lunch and dinner and you’ll be free to help yourself to fresh fruit, coffee, tea, alcohol and soft drinks at any time of day or night. Villa Pia’s chefs prepare delicious local Italian cuisine with the care and attention to detail that Italians are known for. All of their ingredients are locally sourced wherever possible. • Foraging Walk: rambling through the Umbrian countryside with a local expert we’ll pick and identify wild local food including mushrooms, berries and many wild salad plants and herbs. • Trip to the medieval town of Monterchi, where we’ll see the Madonna del Parto, the radical painting of a pregnant Madonna held up as an icon of feminism, by Piero della Francesca. Let us know if you’d rather not walk. Monterchi is a beautiful couple of miles from Villa Pia. Cooking Class. Villa Pia’s cooks are local women who learned to cook from their grandmothers. They’ll be teaching you to make pasta the traditional way or to make a dish that you have enjoyed during your stay. We’ll finish the class with Prosecco. Price around 20 Euro. Making pasta at Villa Pia. Photo by Yvette McGreavy. Truffle Hunting. This was exceptionally popular in previous years. Spend a morning ambling in the woods with a local truffler and his dogs and bring back truffles for dinner. Price around 30 Euro depending on numbers. View over Umbrian hills. Photo by Yvette McGreavy. A non-refundable deposit of £500 is payable now, the remainder being due on July 10th, three months before the retreat. Call us on 0203 176 7907 for more info and to pay over the phone. Or click on the button at the top of this page. Please email [email protected] with any queries and to tell us which type of room you would like to book. All tuition, talks, lectures and trips. Dinner for six nights out of the seven including wine. This leaves one evening free to explore as there are wonderful places to eat and drink nearby in Monterchi and Lippiano. All breakfasts and lunches plus fruit, coffee, tea, alcohol and soft drinks at any time of the day or night. Flights and transport to Villa Pia. Where possible group transport can be arranged. Massage, pilates, and beauty treatments which you can book before or once you have arrived. Numbers will be restricted to the number of rooms. Villa Pia has a total of 24 bedrooms: 12 en suite and 12 with a shared bathroom between 2 rooms. There are also 6 en suite rooms available in the next door castle. For more information about any part of the holiday please call Cathleen on 0203 176 7907. Transport between Perugia and Villa Pia will cost around £20 each way per person depending on our numbers. We’ll let you know when numbers are confirmed. Your ticket fare will be collected on the bus. There are also flights to Florence, Pisa and Bologna. The journey to Villa Pia is longer but there is more choice of departure airports and flights. You can also travel under your own steam and get to Arezzo by train. This is only 20 mins from Villa Pia and there are plenty of taxis outside the station, cost approx 50€. • If your booking is cancelled less than 8 weeks before the start of your holiday 100% of the total price is forfeited. Please ensure that your travel insurance is arranged at the time of booking. • Holiday Insurance: It is a condition of accepting your booking that you have personal travel insurance, including cancellation insurance for medical reasons, redundancy, jury service etc. for all members of your party. Please note that the use of Villa Pia, its facilities, grounds, and swimming pool are entirely at the user’s risk. I really loved it from start to finish. The talks were the perfect balance of humorous and intellectual; my fellow Idlers couldn't have been lovelier; the surroundings were inspiring and I left feeling rejuvenated and inspired. A truly lovely memory of what was one of the best weeks of my life. I could not have hoped or wished for better. I loved the diversity of things on offer but also appreciated the freedom to dip in and out. The programme was the perfect balance of intellectual interests and playful fun. I enjoyed getting to know the eclectic mix of fellow idlers. It felt really inclusive - you always had the option to opt out but no one was ever left out. Villa Pia is a dream. The food was beyond divine and the accommodation beautiful, spotless with the most incredibly welcoming and obliging staff.